They say a picture is worth a thousand words, so if you’re looking to preserve or showcase your treasured memories, the team at Townsville Art and Framing is the answer to all your Townsville custom framing needs. In framing today, the items customers typically wish to frame are more complex and require higher skills to achieve the perfect finish. At Townsville Art and Framing, we have been conserving people’s memories for almost fifty years by applying the highest level of care and attention to detail. To find out more call us on 07 4775 3347, email us or enquire online here. For a no obligation consult visit us instore at Domain Central – 103 Duckworth Street, Garbutt Queensland. We often find people have a lot of questions or are a bit unsure about the framing process. Here’s a little bit more about how we can help you. What are some memories that people come to you to frame? We have framed everything from Korean wedding costumes, Persian rugs, Egyptian antique papers, World War 1 army jackets, to 100-year-old marine maps, in addition to more straightforward certificates and sporting memorabilia. What is the process for custom framing? We recommend you visit us for a free appraisal of the work to be framed along with a colour consultation. During this consult we’ll discuss pricing, what the work entails, along with all available options in terms of style and materials for the specific item to be framed (plus provide a recommendation based on our experience). This will help you make an informed decision. bring in your treasured items so we can prepare a quote based on the dimensions and preferred framing materials you choose. Leave your item with us to complete the custom framing process. Once we have the total accurate dimensions – we will create the frame from scratch. We stock a lot of materials but we may need to order additional items for special requests. Once the frame has been made, we carefully mount your item per your brief taking lots of care during the process to achieve the best result. We will call you when the item is completed for collection. What are some examples/items people have had custom framed? Have a look at our large online gallery to see some of the work we have done. What are some of the myths around custom framing? Do people assume it is too costly? The biggest myth is that an item won’t be hard to frame, however, most people vastly underestimate the skill required to get the best result. Our team of experts have the knowledge and experience to always achieve a professional high standard. Why choose Townsville Art and Framing? Not only do we provide custom framing services but we also stock a wide range of art and painting supplies. We have a reputation for a high standard in customer service, a high professional standard and we frame the most complex items. We have been in business for almost 50 years, framing treasured memories, keepsakes, wedding photos, embroideries, memorabilia and a wide variety of objects. We have formal and practical training in framing and associated industries. We can custom make a frame to suit your personal preferences and unique items. The majority of our mouldings are Australian made, sourced from sustainable pine plantations. All of our frames – including our in-store ready-made items – are handmade locally in Townsville by our experienced framers. Our team take great care in ensuring there is always a high, professional standard of workmanship and customer service. For all your custom framing needs, call Townsville Art and Framing on 07 4775 3347 or drop by and see us at our shop at 103 Duckworth Street, Garbutt Queensland (Domain Central). 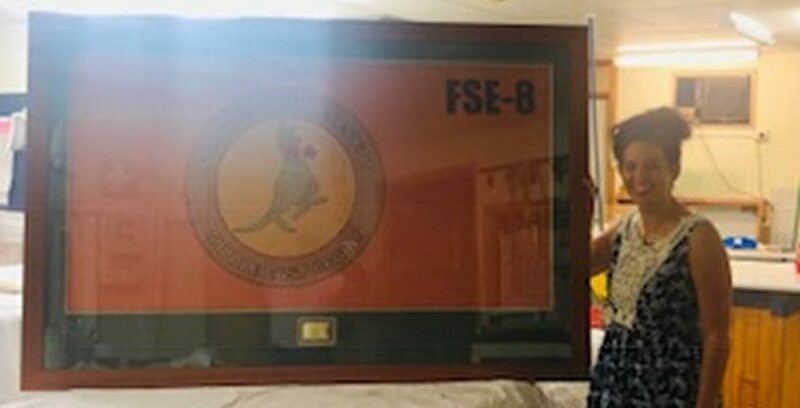 Townsville Art and Framing is the longest established custom framing business in Townsville. ® COPYRIGHT 2016 All Rights Reserved.